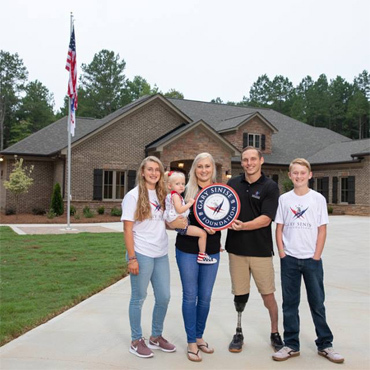 ST. LOUIS, Missouri (August 2, 2018) – The National Wood Flooring Association (NWFA) has provided flooring for its 33rd home in support of the Gary Sinise Foundation R.I.S.E. program (Restoring Independence Supporting Empowerment). The R.I.S.E. program builds custom, specially adapted smart homes for severely wounded veterans and first responders. 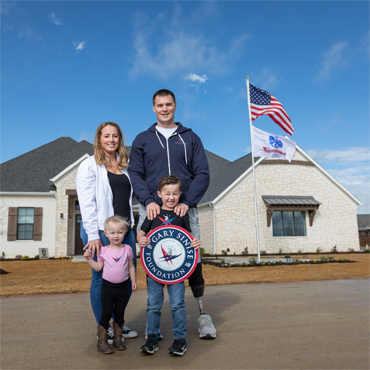 The home dedication for United States Army Sergeant Eric Hunter (Ret.) took place on August 1, in Fayetteville, Georgia. Flooring for the project was donated by NWFA members Mullican Flooring, JJ Haines, and DriTac Flooring Products. Sergeant Hunter joined the military at age 22, and was first deployed in 2010 to Iraq. During his second deployment, in Southern Helmand Province, Afghanistan, Sergeant Hunter was on a dismounted patrol with his unit when he stepped on an improvised explosive device (IED). The bomb took his right leg, and shattered his left, along with many other injuries. Photo: US Army Sergeant Eric Hunter (Ret. ), his wife Kenna, and their three children. In addition to the 33 homes already completed, NWFA currently is working with its members to source wood flooring for 17 additional R.I.S.E. homes in various stages of planning and construction. Currently, 56 NWFA member companies have donated product, logistics, and installation services in locations throughout the United States, with a total value of more than $4.0 million. A list of all NWFA R.I.S.E. participating companies can be found at http://www.nwfa.org/giving-back.aspx. By the end of this year, 68 specially adapted smart homes will be completed or underway through the Gary Sinise Foundation R.I.S.E. program. To learn more about the program, and how you and/or your company can get involved, contact the NWFA at 800.422.4556, or e-mail them at anita.howard@nwfa.org. The National Wood Flooring Association is a not-for-profit trade organization, with more than 3,500 member companies world-wide, dedicated to educating consumers, architects, designers, specifiers and builders in the uses and benefits of wood flooring. The NWFA is located at 111 Chesterfield Industrial Boulevard, Chesterfield, MO 63005, and can be contacted at 800.422.4556 (USA & Canada), 636.519.9663 (local and international), or at www.nwfa.org.